In this example I will launch some torpedoes against a Oiler, setting the torpedoes course. 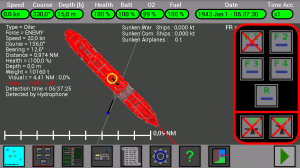 A new merchant ship is coming near, it is a Oiler, and it has a gun ! 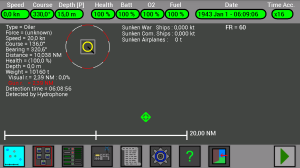 I press the button to open the Torpedoes Launch window, so I can check better the ship course. 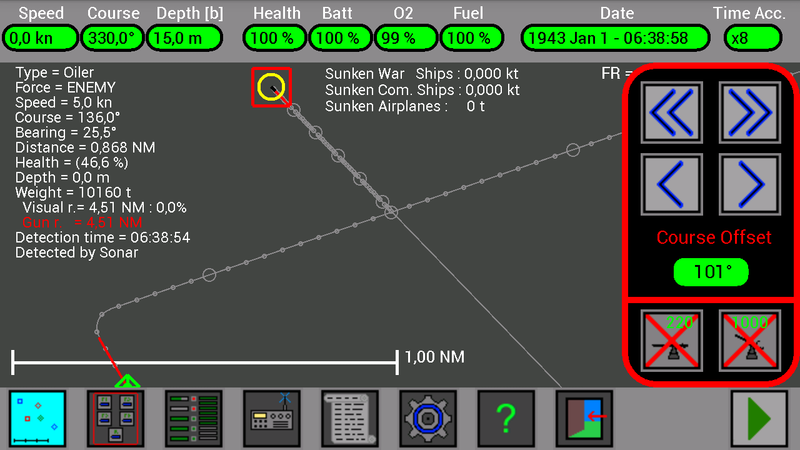 I don’t know if it is enemy, allied or neutral, I select my U-Boat to show my visual range on the map, the ship is outside my visual range. Note that the sun is raising (the time is 06:26:40) and the visual/gun ranges of all units are increasing, when I will know if the ship is enemy or not, I will have to lower my periscope to remain undetected. Ok, the ship is ENEMY, I will lower my periscope to remain undetected. I want to sink it, but I see that if I launch a torpedo now, the torpedo would not hit the ship (look at the gray lines and their circles). 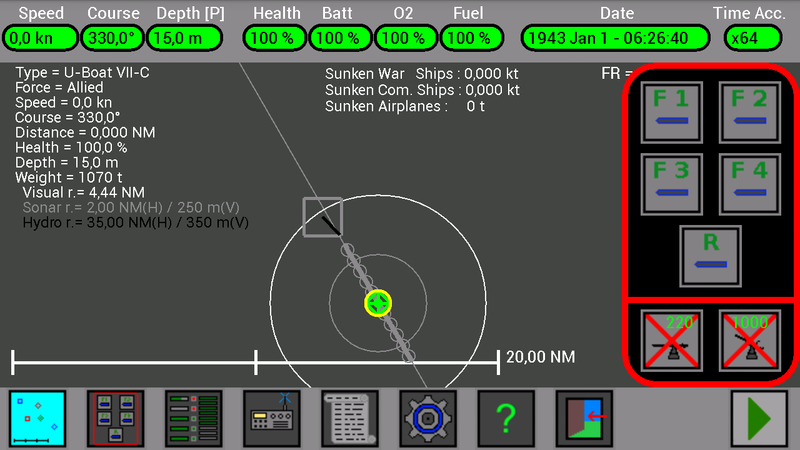 I will not turn my U-Boat, but instead I will change the torpedoes course. 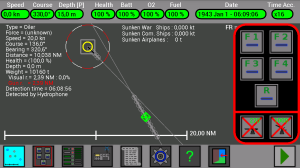 I press again the button on the lower bar to open the Torpedoes Course Setting window. 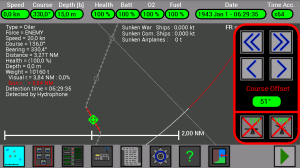 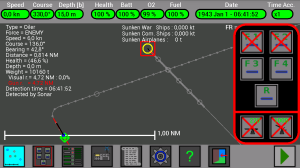 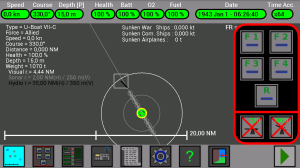 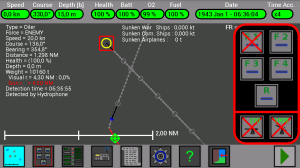 I increase the Course Offset using the “>>” button, look at the gray line in front of my U-Boat, it is curved on the right. I increase the Course Offset up to 51°, to put my 2° circle over the gray line of the enemy ship. Now the 2° circle on the ship line coincide with the 2° circle on my line, I press 2 times the button to open again the Torpedoes Launch window and I launch one torpedo. 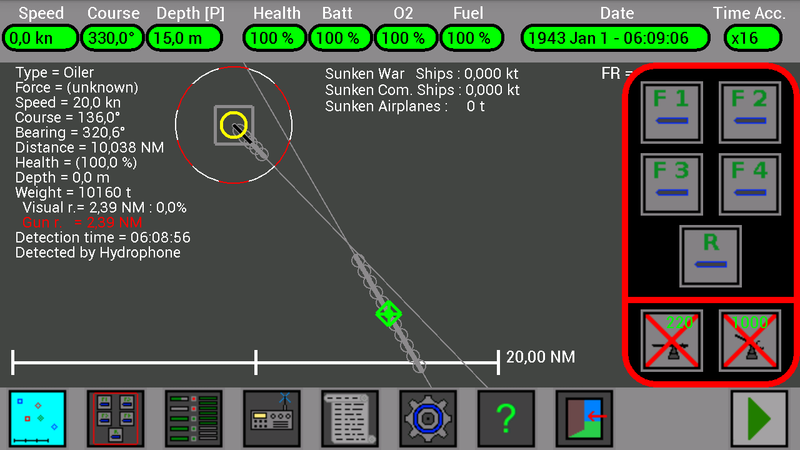 The torpedo runs straight and then changes its course, following the gray line. Note: the torpedo after the launch remembers its course setting, if I want I can change the Course Offset for a next torpedo, I don’t have to wait for the running torpedo to hit the ship. 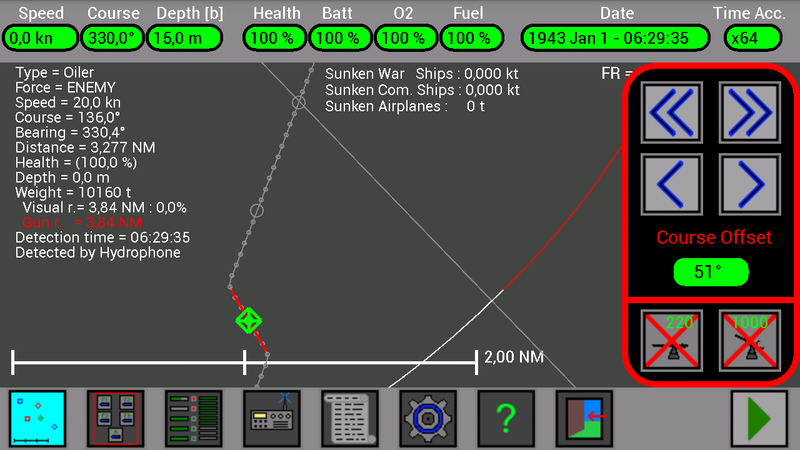 Good, the torpedo will hit the ship. The torpedo hit the ship, the ship is still on the map and its health is always 100%… why ? 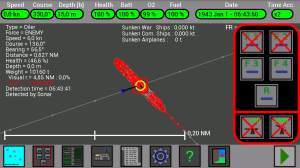 It is because my periscope is lowered [b] and I don’t see the ship, I know that it is there because I detect it with my sonar (Detected by Sonar). 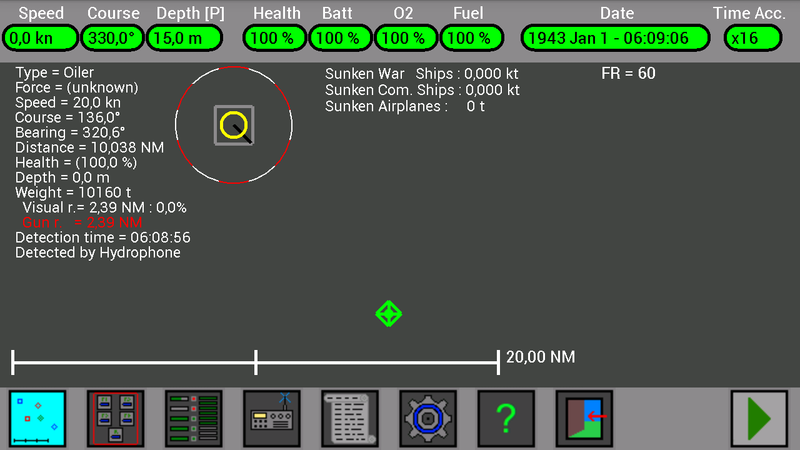 Note that its health is “(100%)“, not “100%“, it means that the value is not updated, I have to raise for a moment my periscope to see the ship and valuate its health. 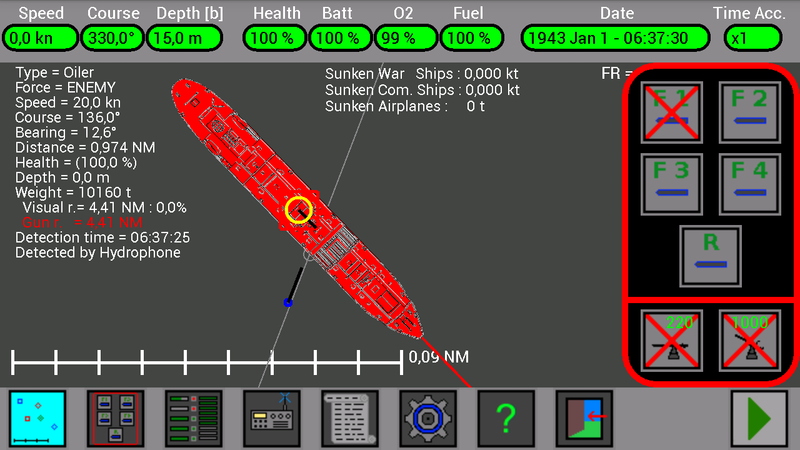 Now, with the periscope raised [P], the health of the ship becomes “46.6%“, the ship is “Detected by Sight“. I can lower again the pericope to remain undetected. 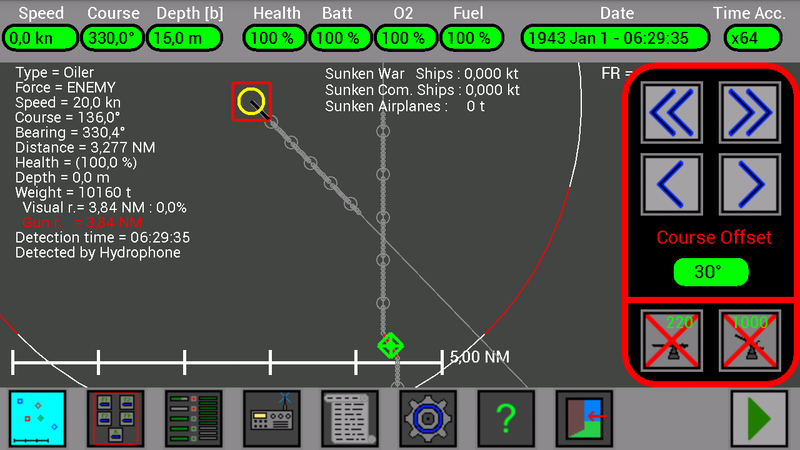 Before launching the second torpedo, I will increase again its Course Offset. I increase it up to 101°, to put my 2° circle over the line of the ship, and I will wait for the 2° circle of the ship to coincide with my 2° circle. The 2° circle of the ship concides with my 2° circle, I launch the torpedo !